One of the promises in the Manifesto of 1763, by Catherine II, was the exemption from military duty. This promise was of great importance to the colonists who had come from areas ravaged by the Thirty Year's and the Seven Year's Wars. The promise was kept until the reforms of 1874 stripped away this exemption. 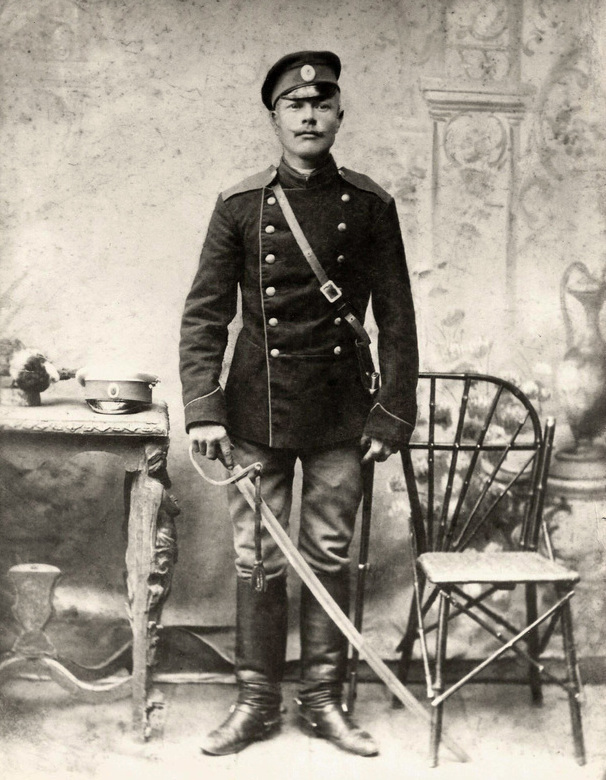 As a result, many young men from Norka were conscripted into military service and served honorably in the Russo-Turkish War, the Russo-Japanese War, World War I and World War II (until the deportation of the Volga Germans in 1941). The withdrawal of military exemption was one of the primary factors that triggered immigration to the Americas. The first men from Norka were called to service in 1874. Johann Georg Maul (1879-1958) was born in Norka and served in the Russian Army for 5 years from 1905-1910. Georg was part of the 7th Kinburn Dragoon commanded by His Imperial Highness Grand Duke Mikhail Nikolaevich. From 1905-1910 his regiment was stationed in the town of Kovel in Volyn province. Courtesy of Debbi Hafling and Alexey Korostel. Military conscription was spread across the "internal empire" (primarily ethnic Russian population) and was divided into 208 uyezdi (districts) upon which the recruiting was based. Each of these districts was then divided into several recruiting sub-divisions (prizivniye uchastki). The 208 uyezdi correspond in number to the 208 infantry regiments of the active army but the recruiting system was only partly territorial. The regiments received roughly 30 percent from their territorial district, 15-25 percent from subsidiary districts and 45-55 percent from other Russian populated recruiting districts. No more than 25 percent of recruits for any one unit could be of non-Russian origin. Therefore if the man in question was an infantryman of "German" origin or his area was predominantly non-Russian he could well have been recruited into a regiment associated with another district. There are also subsidiary recruiting districts (those with non-Russian or small populations including, the Baltic states, Poland, western frontier regions, certain parts of Volga region, and parts of Caucasia. Jewish recruits were distributed throughout army but not allowed in the Guards unless they had converted to the Russian Orthodox faith. Riflemen, cavalry, horse artillery, engineers, guards, and grenadiers were recruited from the whole empire. Recruitment normally took place from October 14th to November 14th (after harvest) but could be adjusted to suit local conditions. All recruitment occurred between September 28th and November 28th. The process was carried out by recruiting committees: Uyezdni committee and Gubernski committee. As a result, the recruiting records reside at the Uyezd and Guberniya level. Infantry and foot artillery: Three years followed by 15 years in reserve. Other branches: Four years followed by 13 years in reserve. Many family stories refer to a five-year enlistment. A "five-year" service term could arise as the period of service with the army was taken from the 14th January following the date when the annual contingent joined up (from September to November of the previous year) so a four-year man would actually serve four years and three-plus months. The reserves were divided into first and second class depending on how recent their service with the colors. Service period - volnopredyelayushchiesya (short term volunteers) If certain educational criteria were met one could enlist in this class (mainly used for supply of reserve officers) Join between 28th June and 14th July and serve 18 months, two years with the army and then 16 years in reserve. Service period - Okhotniki (other volunteers). This group was comprised of men of over the age of 18 who wished to join before conscription age, men previously excused from service if still under 30, and men permitted to postpone service on account of family reasons. All serve according to regular service periods unless qualified as short term volunteers. These men had the advantage of choosing their branch of service. The Daghestan Horse Regiment and Turkomen Horse Division were a class of their own and were all voluntary service. These men were paid a higher rate but brought their own horse and provided their own food and forage. Cossacks provided their own clothing, arms (except rifle and lance), equipment, and horse. Service commenced on completion of their 20th year and lasted 18 years. Information on Russian Imperial Army service provided by Marcus Sherwood-Jenkins and posted on the Ger-Volga electronic discussion list.